Item #PWT-SSM-AM-8: Approx. 1" pewter miner on 1" or larger Amethyst crystals. Item #AM-AG-AM-500: Approx. 19.5"x10" Agate and Amethyst geode slice (Urugary). Item #AM-AG-AM-350: Approx. 16.5"x6.5" Agate and Amethyst geode slice (Urugary). Item #AM-A-FLW-125: 4 1/2"x3 3/4" Amethyst "flower" specimen from Rio Grande dol Sol, Brazil. Item #MS-862: Approximately 2.5"x1.5" Amethyst (Brazil). Item #MS-865: Approximately 8"x4.5" Amethyst of 7.78 lbs. Item #AM-AM-GE-30: Approx. 4.5"x4"x2.25" Amethyst geode (Uruguay) of 2 lbs. Item #MS-857: 6.25"x3.5" tall Amethyst Geode of 2.95 lbs. Item #MS-867: 5.75"x7.5" Amethyst Geode of 5 lbs. Item #MS-869: 6"x4.25" Amethyst Geode of 1.70 lbs. Item #MS-870: 4.5"x3" Amethyst Geode of 1.90 lbs. Item #MS-890: Approx. 11"x5.5" Amethyst Geode of 17 lbs. 6 0z. Item #MS-990: Approx. 15"x6" tall Amethyst geode of 20 lbs. Item #AM-GEO-150: Average 6.5"x3.5" Amethyst Geode (Brazil) on wooden base. 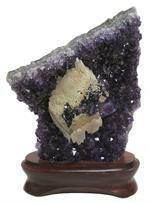 Item #MS-850: Approximately 7.25"x4.75" tall Amethyst Geode (Uraguay) on wooden stand. 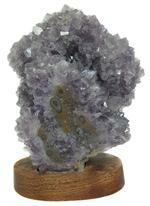 Item #AM-AMT-75: Amethyst on 1" tall wooden stand in various shapes and sizes. Item #AM-AQ-350: Approximately 4.5"x6" Amethyst (Brazil) on wooden stand. 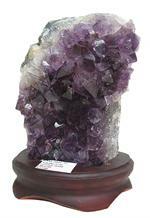 Item #MS-585: Amethyst paperweight of 1.5 - 2 lbs. Item #AMP-KC-25: Amethyst point key chains. 10 pieces. Lengths range on average from 3.5-4.5 inches. Item #AM-STL-100: 3.5x2" tall Amethyst polished stalactite on wooden stand. 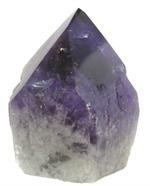 Item #AM-AQC-250: 5"x7" tall Amethyst Quartz with Calcite from Uruguay of 1.78 lbs. on wooden base. Item #MS-873: Amethyst point specimen ranging from .75”-2” long. Item #AM-ASTS-16: Average approximately 1"-1 1/2" Round Amethyst stalactite slice from Artigas, Uruguay. Item #MS-852: Approximately 1.25"x1" Amethyst stalactite slice of 7.84 grams. Item #ASTS-1: Approximately 4.5"x3.5" Amethyst stalactite slice. Item #ASTS-2: Approximately 4.75"x3.75" Amethyst stalactite slice. Item #AMT-TS-25-5: 25 pieces of Amethyst tumbled stones. Item #AM-A-QZ-175: 6 3/4"x2" Amethyst specimen with double terminating crystals from Rio Grande dol Sol, Brazil on wooden stand. Item #AM-MGP-30: Approximately 1.25" sliced, mini Amethyst geode pair from Rio Grande do Sul, Brazil. Item #PWT-BR-AM-8: Approx. 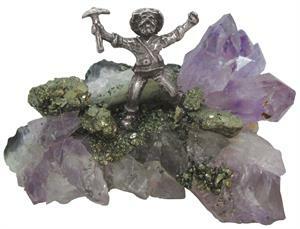 .5" pewter bear on 1" or larger Amethyst crystals. Item #PWT-E-AM-8: Approx. 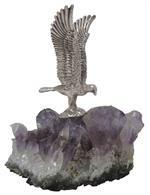 1.75" pewter eagle on 1" or larger Amethyst crystals. Item #PWT-AM-RC-8: Approx. 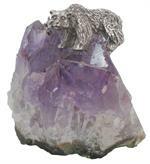 .5" pewter raccoon on 1" or larger Amethyst crystals. Item #PWT-AM-SQ-8: Approx. 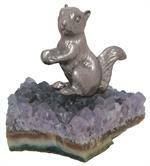 1.25" pewter squirrel on 1" or larger Amethyst crystals. Item #AM-PAS-150: 5x5.5" tall polished Amethyst (Uruguay) Specimen of 2.12 lbs. on .5" wooden stand. Item #MS-847: Approximately 6"x6.5" Rose Amethyst (Brazil) of 4.2 lbs. Item #MS-848: Approximately 7.25"x6.25" Rose Amethyst of 8.70 lbs. on wooden base. Item #MS-858: Approximately 3"x3.75" Small Amethyst geode pair. Item #TAD-5-5: 5 pieces of thin Amethyst drusy (Uruguay) ranging in size from 1.5"x1.5" to .75"x1.25".